The DiSC Assessment harnesses the power of the third generation of the DiSC model, one of the most widely used, scientifically-based approaches to assessing personality and developing critical interpersonal business skills. Everything DiSC programs help people to connect better with others. 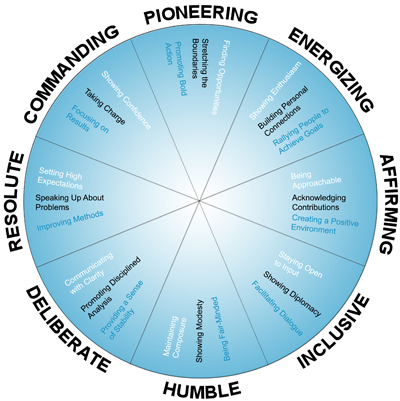 Each Everything DiSC Assessment has unique assessment items to measure topic-specific priorities for leadership, sales, management and workplace development, with in-depth information, including tips, strategies and action plans to help learners become more effective. Each person who takes the Everything DiSC Assessment is plotted on a circle, also known as the Everything DiSC map. The DiSC Assessment asks participants to respond to statements on a five-point ordered response scale, indicating how much they agree with each statement. 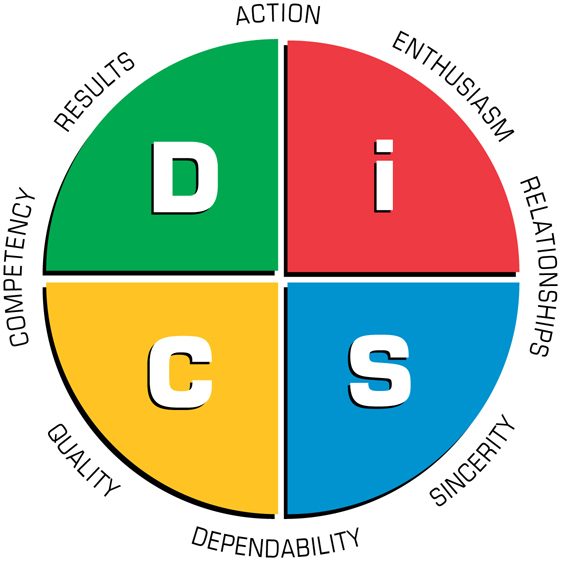 The Everything DiSC Assessment does not measure each DiSC score separately as it does in traditional line-graph format in the DiSC Classic Profiles; the responses are used to form scores on eight scales that are located equally spaced around the DiSC circle. The participant’s scores on these eight scales are used to plot the individual on the Everything DiSC Map represented by a dot. The map is divided into 12 sections or styles. 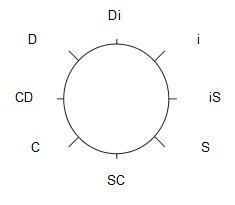 Within each of the four basic D, I, S and C styles there are three regions where a person’s dot may be located. The participant’s feedback is based on the section in which their dot falls and also on the distance of the dot from the center of the circle. Map shading is also important. The eight words around the Everything DiSC map represent priorities, or the primary areas where people focus their energy. The closer the participant’s shading comes to a priority, the more likely they are to focus their energy on that area. The DiSC Assessment—the questions that a participant responds to—changed in July 2012. Adaptive testing, an interactive assessment process that tailors questions based on an individual’s responses, was added to the Everything DiSC Assessments to assign participants’ DiSC styles more precisely than ever. The adaptive testing technology tailors questions to the individual. People who respond inconsistently to any given set of statements will be asked to respond to more statements; or if their responses show that they have two equally strong styles, more questions will be given to determine if one style is stronger than the other. The adaptive testing data is now incorporated into DiSC style assignments allowing participants to see all of their priorities reflected in their feedback. Personalized shading indicates whether you stretch to include any additional priorities that aren’t usual for your DiSC style. These unexpected priorities are marked by striped shading. 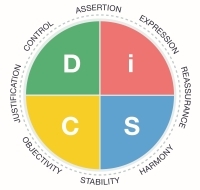 Because the Everything DiSC Assessment measures participants on eight scales around the DiSC circle, it provides more accuracy about the participant’s true DiSC style. With its circular DiSC map, Everything DiSC Assessments offer applications layers for the DiSC model that help participants see the relevance of DiSC to their profession. Participants easily understand how The DiSC Assessment relates to their goals and developmental needs and how to connect better with coworkers, improve their workplace and be more successful at their jobs. Everything DiSC Workplace helps people better understand how they approach their work. It can be used with everyone in an organization regardless of role or title to provide a wealth of information about their workplace priorities and preferences. It allows participants to understand and appreciate their own workplace styles, as well as the styles of their coworkers resulting in more effective and productive working relationships. Workplace conflict is inevitable in every workplace and looks different depending on the situation and people involved--from brief disputes to subtle long-lasting issues. Everything DiSC Productive Conflict helps individuals improve their self-awareness around conflict behaviors. Everything DiSC Management helps managers understand how they approach their work and teaches them how to bring out the best in each employee. Managers learn how to read employee styles and adapt their own DiSC styles to manage more effectively. Everything DiSC Sales helps salespeople connect better with their customers by understanding their DiSC style, and adapting their style to meet their customers’ needs. Everything DiSC 363 for Leaders is the first 360 for DiSC users. It is designed for organizations that want to use 360 feedback as part of its leadership development, whether they’re developing the strength of emerging leaders or honing the skills of experienced executives. Everything DiSC Work of Leaders is a unique leadership development program that simplifies the work of leaders into three tangible steps: Vision, Alignment and Execution. The program on developing leadership best practices for building emerging leaders or honing the skills of experienced executives. Everything DiSC follow-up tools enhance trainers’ follow-up opportunities and help keep the training alive. Everything DiSC Comparison Reports can be created for any two participants that illustrate their similarities and differences in six areas. The purpose of the report is to improve communication and efficiency, while reducing tension and misunderstanding. Everything DiSC Supplement for Facilitators is a valuable tool for any facilitator by providing more detailed assessment data about a respondent’s DiSC style including unexpected items. Everything DiSC 363 for Leaders Coaching Supplement provides additional information to help deliver feedback to the leader. By learning their DiSC style, people can gain a better understanding of their own strengths, fears, stressors, motivators and challenges, but more importantly they learn how to use DiSC to strengthen relationships with others, building, stronger, better functioning relationships.